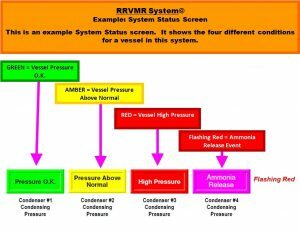 The RRVMRS is a new system that monitors all vessel pressures in a refrigeration system and alarms on any abnormal pressure identifying the vessel and its location. The system maintains an enhanced monitoring of any abnormal or high pressure condition and if a release condition should develop, the system automatically catalogues the start time, measures in real time the duration and then catalogues the end time of the event. During a monitored release the system calculates the accurate refrigerant loss in real time and then displays the actual loss at the end of the event. The system is adaptable to any relief valve arrangement, existing or new relief valve vent piping and size large or small. For more information please view the external files from the menu above. Ammonia refrigeration systems are pressurized mechanical systems that have a hazardous Group 2 refrigerant contained inside. 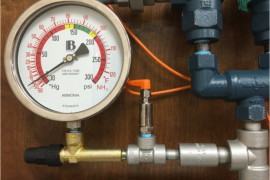 These systems have operating pressures that can reach 250 PSI to 300 PSI. 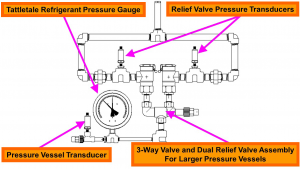 By ASME Code, pressure vessels shall be provided with a means of overpressure protection. 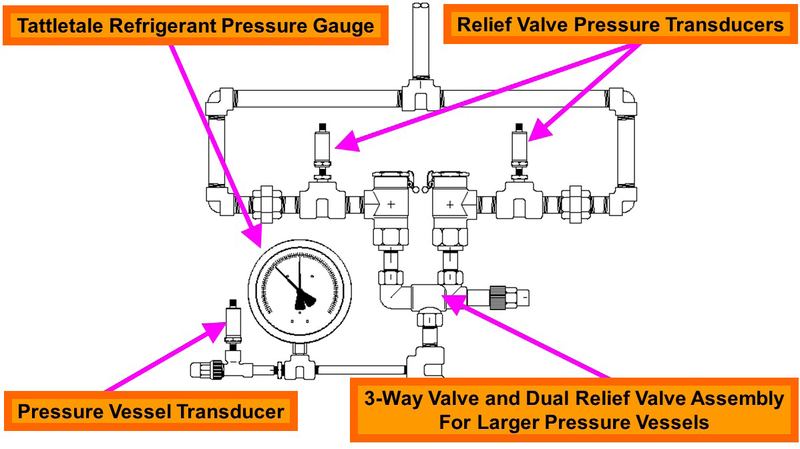 The use of an overpressure protection device (rupture disc, pressure relief valve, pressure safety device) is the preferred and approved standard to safeguard a pressure vessel. ammonia pressure vessels in the Refrigeration System and alarm for abnormal High Pressure. 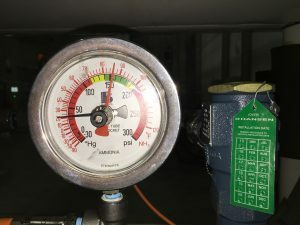 ammonia relief device in the Refrigeration System for a release event. 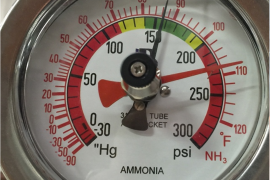 One of the most unique features of the Refrigerant Relief Valve Monitoring and Reporting System© is the methodology used to define the loss of ammonia, in pounds during a relief device release event. 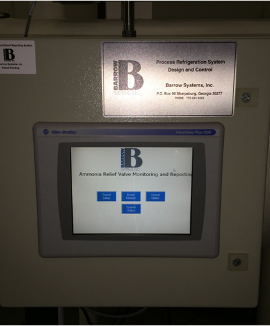 Based on each relief device manufacturers certified and published ratings for flow at stated parameters, and using established mathematical calculations, it is possible to measure a relief device release over a range of time and pressures and define the loss of ammonia refrigerant in pounds with pinpoint accuracy. Viewing: This system has the capability to show the system screens on a computer monitor, overhead TV monitors, remote Panel View or tablets/cell phones. A stack light or other visual, or audible aids could be placed in strategic locations in the facility to alert personnel of developing conditions in the system. 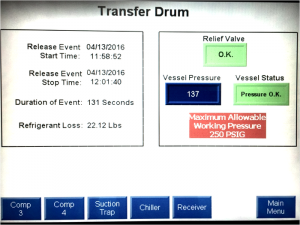 Reporting: Once a Refrigerant release occurs, the data about the release can be printed out on a printer. The Release data may be emailed to a computer or Smartphone/tablet. Designated personnel may be alerted of the release by telephone or email. Data Logging: There are many different Data Loggers on the market with many levels of capability. Any of the data Loggers should be compatible with the System. Relief Valve Vent Header Purge: Many ammonia systems implement an ammonia sniffer/leak detector in the vent header. After a release event, residual ammonia remains in the vent header. With residual ammonia it is difficult to clear the sniffer. The Air Purge system can pulse compressed air through the vent header to facilitate clearing the header of residual ammonia. The options above are some of the more popular options, however the system is not limited to these options. 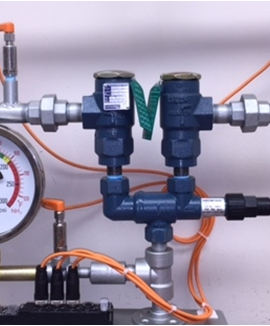 Visual demonstration of a real time Relief Valve release event. 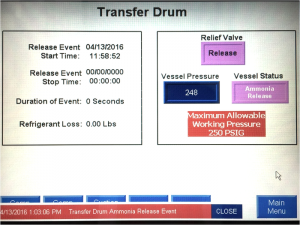 Please click the above image or visit the following YouTube Page for a visual demonstration of a real time Relief Valve release event. We would love your feedback! For more information regarding our custom refrigeration solutions or Refrigerant Relief Monitoring and Reporting System, please fill out the form below.